Sometimes it’s just too hot to really want to eat. You know what I’m talking about. Simple cool rice noodle salads are a refreshing meal when the nights are hot and sticky and days are unbearable. 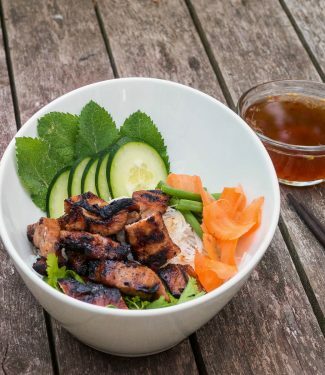 Vietnamese pork bun is a cool refreshing summertime dinner. This is recipe but it’s also a guideline. Marinate some pork, or maybe chicken. Chop up some raw vegetables. Like it spicy – add some thinly sliced fresh chiles. Grill a bit of meat. Toss it all on top of rice noodle and drown the whole thing in that wonderful hot, sweet, salty and sour nuoc cham dipping sauce. Some fresh herbs – cilantro, basil or mint and maybe some thinly sliced chilies and dinner is served. 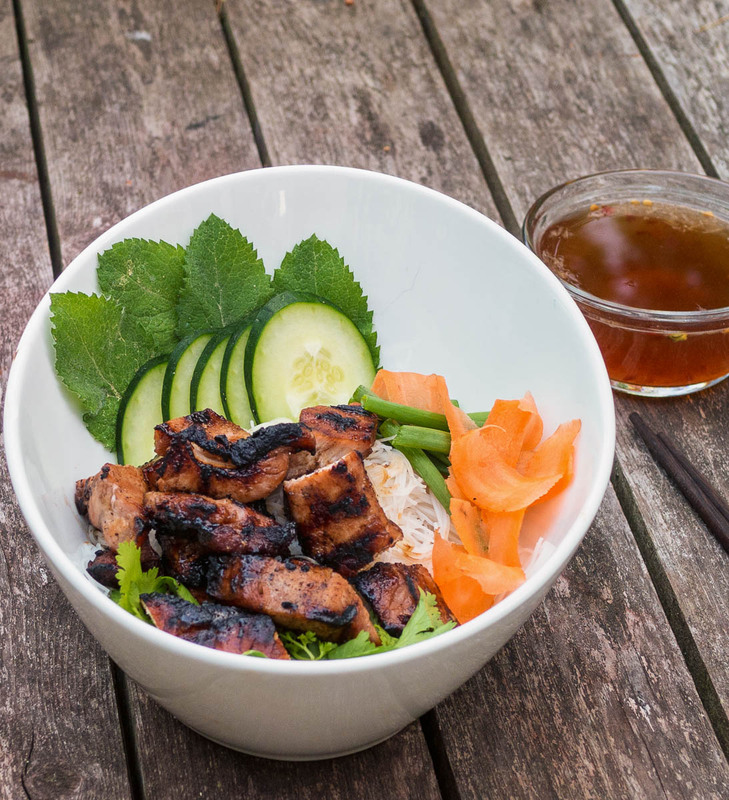 If you haven't tried nuoc cham, this vietnamese pork bun is a good place to start. Combine all marinade ingredients with the pork and refrigerate for 1-2 hours. Pour boiling water over the rice noodles to soften (follow the instructions on the package) and chill the noodles. Running cold water over the noodles to chill works nicely. Pre-heat your grill to medium hot. Dip a paper towel into some vegetable oil and rub the grill with it to help prevent sticking. and grill the pork until cooked through, about 3-5 minutes. Let the pork char a little bit. As always - this is better cooked over charcoal. 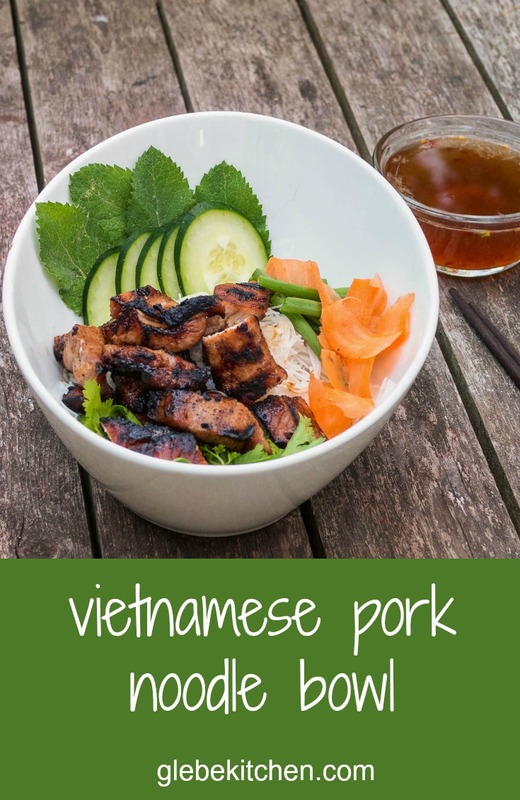 To serve, divide rice noodles into two bowls and top with chopped vegetables, cilantro and mint and pork. Pour 1/2 the nuoc cham over each bowl (or serve on the side and let people season to taste). Combine all ingredients in a small sauce pan and heat to a simmer. Cool and serve. In main course, meat, noodles, pork, vietnamese. Bookmark the permalink.